If the Arab Gulf was a family, Dubai would be the chain smoking teenager with ill advised tattoos and an attitude problem. The bad boy of the Middle East first hit headlines for its never ending stream of Disney inspired developments and party lifestyle. But after the city’s financial fall from grace and a well deserved bum smacking from conservative neighbour Abu Dhabi, a more subdued Dubai emerged from the wreckage in 2010. Having spent more than a year living in the city, I won’t deny there’s a great deal of truth in the (many) allegations that have been thrown at Dubai. As a committed tree hugging lefty (the kind with really nice shoes) I have never and will never condone the city’s regime. But in the famous words of Thumper the rabbit; “if you can’t say something nice, don’t say nothing at all”. So for now I’d like to steer you away from the dark side of Dubai. After all it’s not all prostitution and plastic palm trees. When it comes to shiny things I’m like a magpie on amphetamines. Suffice to say, the city’s traditional gold souk in the Al Dhagaya region of Deira does not disappoint. With more than 300 shop windows twinkling like Christmas trees, I challenge you not to buy the biggest, most sparkly ring you can find and practise proposing to yourself. (Not loudly obviously. Or people will think you’re weird.) Even if you’re not in the market for diamonds, you should come away with some bargains. Just make sure you do your research on current gold prices and always, always haggle. Most of Dubai’s charm lies in the less developed region near the creek. Home to Bur Dubai, Deira and the city’s oldest residential area, Bastakiya, there’s a sense of authenticity here that doesn’t exist elsewhere. Take a traditional Abra (river taxi) across the water and eat at one of the small riverside restaurants. Much cheaper than neighbouring hotels, there’s plenty of fresh fish and local Arabic starters to try. If in doubt order a plate of cheese sambousek. You can’t go wrong with cheese. Granted the city’s not renowned for championing women’s rights. But when it comes to women’s rights to cocktails, you’re in the right place. 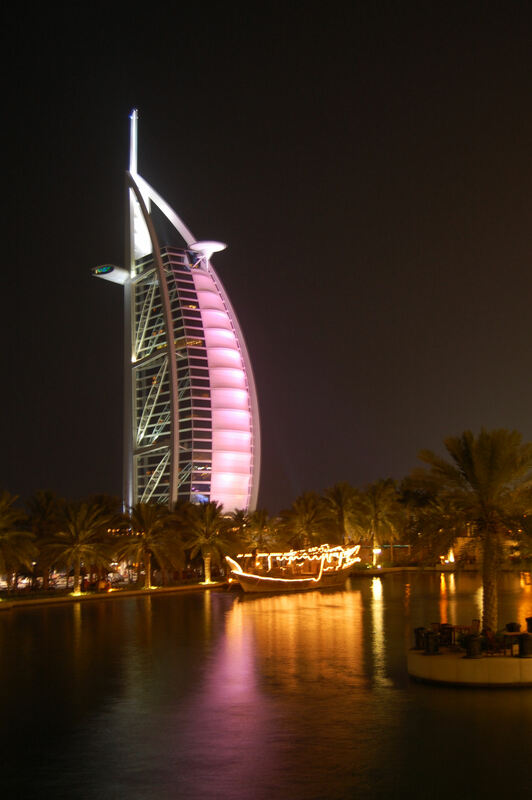 Every Tuesday night (and sometimes Wednesdays and Thursdays) ladies drink free in bars across Dubai. Some offer two or three drinks tokens, others offer an entire evening of free Cava. For weekend drinks, the Irish bar Waxy’s at the Ascot hotel http://www.ascothoteldubai.com/offers free bubbly and alcoholic shushies on a Thursday night. If you like a bit of glamour head to Boudoir http://www.myboudoir.com/ for bubbly with strawberries. What Dubai lacks in pubs, it makes up for in restaurants. Even the uber touristy places at the Madinat Jumeirah have some very nice food on offer, particularly steaks at The Meat Company and posh pub grub at Leftbank. It can be pricey so if you’re looking for something cheaper, head to the curry houses round Bur Dubai where most of the Indian population reside. A plate of butter chicken with rice and traditional naan will set you back around £5. If you want to make a day of it, most hotel restaurants offer Friday brunch. This involves paying a set price and then proceeding to eat and drink as much as is humanely possible in a set time frame. I highly recommend them. While there’s definitely an element of OTT, the city does have a certain flair for building opulent hotels. My personal favourites are probably The Address in Downtown or the neighbouring Palace Hotel (Both part of the Address group ). Service is incredible and the décor is more demure than some of the tacktastic properties near the coast. Five star luxury doesn’t come cheap but if you can take the phenomenal heat of summer it’s much more affordable to go between May and September. Try Dealchecker or Flight Centre’s flash sales (advertised on Twitter) for accommodation and flights. Due to the amount of sand that gets wedged in unfortunate orifices, I’d still say the desert is a bit of a romantic misconception. That said, a trip to Dubai is not complete without a four wheel drive adventure through the sands. If you’ve not hired your own four wheel drive, check out Arabian Adventures or Desert Safari Dubai for dune bashing trips. Word of advice; if your upchuck reflux is as unpredictable as mine, sit up front and give lunch a miss before you set out. You may have heard a lot about Dubai that may be bad or good but it is indeed an amazing destination for a holiday whether your alone or with your loved ones. The last time i went on vacation with my family i was pretty amused by the number of attractions and things on can be part of in Dubai. The best part was i took a flight from http://www.searchcheapflights.co.uk that was quite cheaper than compared to other travel companies. Which in turn led me to spend the saved amount on my vacations in Dubai.